Step back in time and experience "Old Florida". Crystal River is named one of the top small towns in America on the Travel Channel. 18 renovated efficiency suites with modern kitchenettes featuring a full size refrigerator, microwave, range, coffeemaker, daily housekeeping and free WiFi. Convenient parking is just outside your door. All rooms are ground floor. 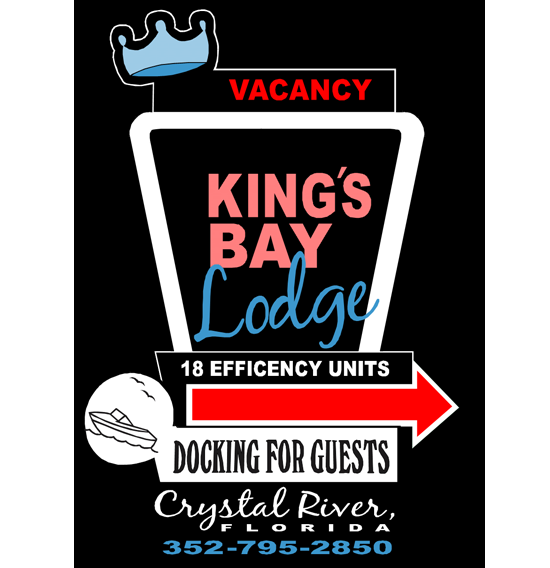 Floating boat docks and a fish cleaning station for registered guests. Feel the beauty of the Nature Coast. Swim with gentle manatees, scalloping, fishing, paddling, biking etc. Close to Three Sister Springs. Located in the heart of the Historic District on the Riverwalk. You can walk to parks,adventure tours, bars, restaurants and local shops. Now accepting one night stays! Special discounted rates apply for weekly stays when available. All rooms are non-smoking. Sorry, we cannot accommodate pets. 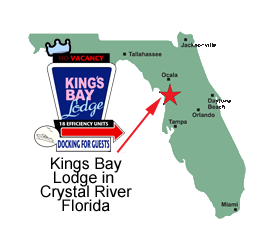 Kings Bay Lodge is a sanctuary on the waterfront, away from the hustle and bustle of everyday life. We look forward to arranging your stay. Please call us at 352-795-2850 for a more personalized service.